On October 16 Dutch Henry finished picking grapes for the 2010 harvest. Last to the finish line was the Yountville Merlot. In 2009 we ended with Merlot as well. While dumping the last half ton into the the first drizzle from a major rainstorm started to fall. This year we finished the Merlot and that night had the beginning of a “six inch” rainstorm. The Dutch Henry Gang has inddeed been lucky. 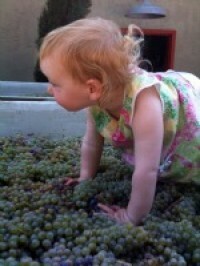 We are really excited about this harvest which has been really tricky for most wineries and growers. Somehow our vineyards dodged mother natures bullets. We are currently finishing up fermentations and pressing. Next step: into the barrels, up to the cave, and “nighty-Night” to the 2010 vintage. The October Club Shipment is our wonderful 2006 Napa Valley Estate Syrah. To our club members and special guests, call ahead to make arrangements for our VIP group treatment. Barrel tastings and tours can be arranged by request. Our hospitality facilities are available for small corporate events and celebrations, and all details are available by calling us at 888-224-5879.